• Fact: Philadelphia is averaging a full yard more per rushing play (5.4) than Carolina is per passing play (4.4). • They (i.e. the Eagles) are also a full 2.7 standard deviations above the mean in yards per carry. • Next best is Houston, at 1.7 standard deviations above the mean. • On a related note, here's the team allowing the second-fewest yards per carry: Chicago. 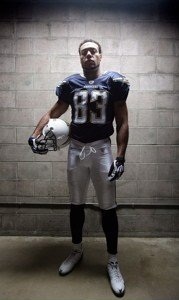 • OMG, Vincent Jackson returns this week. • Here are two things he (i.e. Jackson) did last year: ranked first in WPA/G (0.20) and first in WPA (2.93). • Here are two others: finished tied for second in EPA/P (0.71) and second in WPA (82.6). • Bold prediction: Jackson will be good for what's left of the season. • Huh. That's actually not real bold, is it? • In three games, Troy Smith has averaged 7.2 net yards per pass attempt -- or, about a yard better than league average (6.3). • In seven games, Alex Smith averaged just 5.8 net yards per pass attempt. • Perhaps that's not entirely fair, as the three defenses Troy Smith has faced (Denver, St. Louis, Tampa) are ranked 32nd, 28th, and 20th overall by GWP (average of about 27th overall). • The seven defenses A. Smith faced? They're ranked 16th, on average. • So, that could be a thing. Atlanta is a very pedestrian 19th overall, with a 0.47 GWP, despite a glistening 8-2 record. If Altanta wins this Sunday they may earn the distinction of having fielded the two weakest 9-2 team in history. Check out the 2004 version. I can't find team efficiency ratings for 2004 but by EPA they look quite comparable, and I haven't been able to find any 9-2 squad that looked weaker. Jim - the 2004 Falcons also played against the NFC West. Apparently if you're going to be average one year, do it when you're against the NFC West.